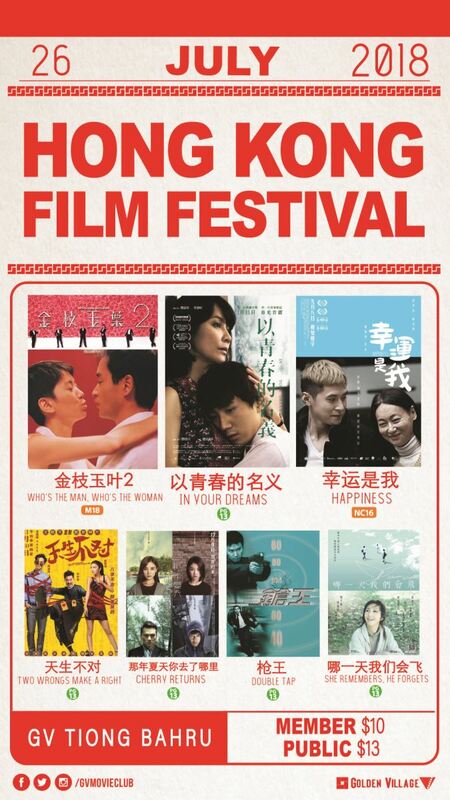 Experience the very best of Cantonese films at the Hong Kong Film Festival at GV Tiong Bahru, from 26 July to 1 August 2018! You won’t want to miss Kara Wei’s scintillating performance in the unique dramedy HAPPINESS, which led to her picking up her third Hong Kong Film Award for Best Actress. Another must-watch performance is that of leading lady Carina Lau’s in the poignant love story IN YOUR DREAMS, where she also served as a film producer for the first time. If you’re a fan of beloved Hong Kong film icon Leslie Cheung, take a trip down memory lane with golden oldies he’s starred in, namely WHO’S THE MAN, WHO’S THE WOMAN and DOUBLE TAP. Alternatively, catch up with more recent Cantonese titles TWO WRONGS MAKE A RIGHT; CHERRY RETURNS; and SHE REMEMEBERS, HE FORGETS. Check out GV's link here for details. Advance ticket sales starts now at www.gv.com.sg, iGV app [on iphones and android], GV Automated Ticketing Machines & GV Box Offices.